Growing up in Oklahoma, I thought these big beautiful fairy tale pumpkins were only in the movies. Then when I visited my first pumpkin patch in MD, I saw rows and rows of beautiful odd-shaped pumpkins in all different colors. 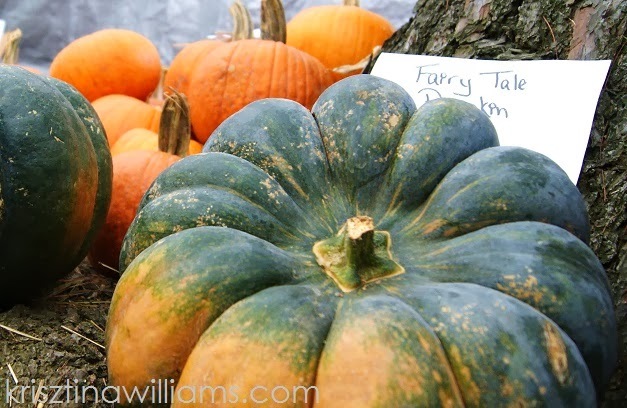 These large fairy tale pumpkins are also referred to as Cinderella pumpkins, because of their resemblance to the pumpkin carriage in the Disney classic. It's a French heirloom pumpkin that is said to have been cultivated by Pilgrims and served at the second Thanksgiving. I've wondered about these. They sell them here in Utah and they seem to be gaining more popularity. Strange, my blog reader is just now showing several blogs from you all at once.